Five friends (stereotypical in slasher movie fashion) decide to escape college life for a weekend and head off to a cabin in the woods. Slowly but surely things start to go wrong, very wrong. Who'd have thunk it? Can they discover the secret behind this wooden structure in a wooded area? I'm going to try not to hype Cabin in the Woods too much and certainly won't be giving anything away (there's a special place in hell for movie spoilerers) but I do have to start by saying that this is easily my favourite film of the year, so far. I can't remember being so surprised at a movie since Scream in '96, the comparison lies only in their originality though, certainly not in content. Having seen the trailers and heard of the plagued release date set backs, I must admit I wasn't too pushed to see it, considering it a rehash of a dated, formulaic teen slasher flick. That may very well have added to my delight once the film started rolling and I was proven so very wrong. 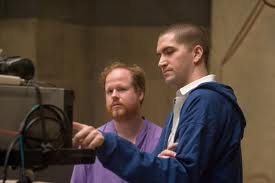 Buffy, Angel and the upcoming Avengers Assemble genius, Joss Whedon writes and produces with Drew Goddard of Cloverfield and Lost writing and directing. A match made in horror comedy heaven. If the fun I had watching is any indication, I can only imagine they'd the time of their lives making it. Whedon and Goddard. They're smiling on the inside. Obvs. The entire cast play a blinder, including the ones from the deepest depths of your nightmares, the scaredy fecks. Acting is fluid and, despite the outlandish scenarios presented, is always believable. Scenes are speckled with memorable characters of both Whedon's casting past and horror movies of yesteryear, which is a very nice touch. A stand out for me has to be Fran Kranz , the resident stoner, his medicine of choice leads to some seriously astute and often hilarious observations. As the story progresses you're launched from absolute distress, the kind that causes you to cover your eyes in horror to guffawing out loud and looking around to see if everyone else is finding it just as good. The timing of comic relief is executed with precision and very welcome on several occasions. A word of warning though, some of the horror scenes are about as horrific as they come, I can't remember when I last saw so much blood on one set so this isn't one for the under 16s by any stretch of the imagination. Cabin in the woods has been branded 'a game changer', 'meta as they come' and, by Whedon himself, 'a love/hate letter to the horror genre'. It's all of those things and more. It's carnage, it's hilarity and it's entertaining as HELL. I found myself wanting to see it again immediately during one scene then instantly swearing not to come the next, I'm not sure my heart could take it. If you're thinking this is just another Hollywood slasher churn out then, in the words of the token 'virgin' herself, Kristen Connolly, 'You're missing the point'. If you want to experience something very new and exciting that'll stay with you for a little while, then get yourself along this weekend, it's definitely one to see on the big screen but hold your popcorn tightly, it's a jumpy, rollicking ride. Brilliant review - I really need to see this!